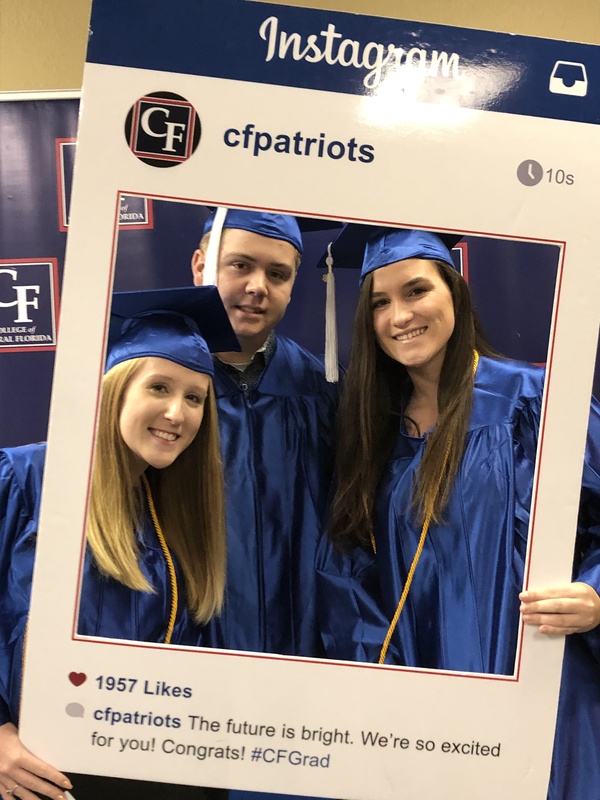 CF will hold its spring 2019 commencement Friday, May 3, with two ceremonies to honor graduates. Both ceremonies will be held at First Baptist Church of Ocala, 2801 S.E. Maricamp Road. Tickets will be required for guests to attend and live streaming of the ceremony will be available. At 3 p.m., students receiving certificates, Associate in Science and bachelor’s degrees will be recognized. The second ceremony, for students receiving an Associate in Arts, will begin at 6 p.m.
For the second time in CF history, tickets will be required for guests to attend the ceremonies to ensure adequate seating for everyone. For four years, CF has split May graduation into two ceremonies to accommodate the greatest number of guests possible. Each graduate who attends the ceremony will receive at least four tickets, and additional tickets may become available as students turn in those that they will not use. Since 2013, CF’s spring graduation ceremonies have been held at First Baptist Church of Ocala, the largest indoor venue in Marion County. In addition to student speakers, the commencement address will be delivered by Kevin Sheilley, President/CEO of the Ocala/Marion County Chamber and Economic Partnership. John S. and Shirley B. Rudnianyn will receive the Distinguished Alumni Award. For more information about CF graduation or to access the live stream, visit www.CF.edu/graduation.